Abilify MyCite, swallowable sensors that track the medication timings of the patient is the first IoT-enabled digital pill manufactured by Proteus Digital Health and Otsuka Pharmaceuticals approved by US Food and Drug Administration tends to revolutionize the healthcare sector. Digital pill is the drug-device combination that comprised of drug embedded with an ingestible marker sensor intended to track drug mechanism and transmits the composed data to the connected digital device such as smartphones, indicated for the treatment of adults with schizophrenia, bipolar I disorder and major depressive disorder and data collected from digital pills are stored and then patients are enables to share the data with their physicians and caretaker. Abilify’s producer Otsuka, worked with sensor tech creators Proteus Digital Health, to create the US’s first digital pills. ABILIFY MYCITE is contraindicated in patients with a history of a hypersensitivity reaction to aripiprazole and reactions have ranged from pruritus/urticaria to anaphylaxis. Goldstein Research analyst forecast the digital pills market size is set to reach USD 0.26 billion by 2024, at a CAGR of 7.5% over the forecast years. The global antipsychotic drugs market size was valued at USD 12.2 billion in 2016 and is expected to grow at a CAGR of 3.45% over the forecast period. 21 million people worldwide are affected by Schizophrenia that is more common among males (12 million) comparatively to females (9 million). Mental illness generally cost the UK economy around USD 91.2 billion each year. 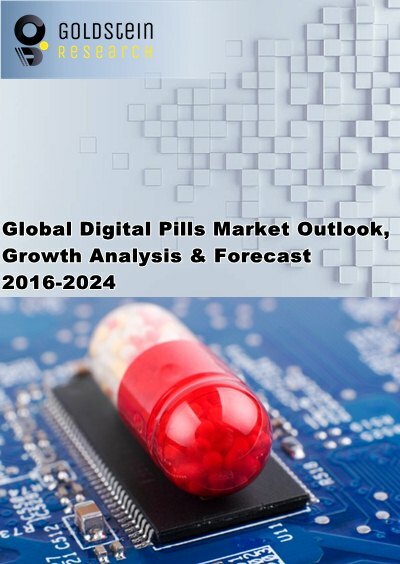 The report covers the present ground scenario and the future growth prospects of the digital pills market for 2016-2024 along with new product launches, clinical trials, market initiatives, high expense on research and development, agreements, joint ventures, partnerships, acquisitions, and others to increase their footprints in this market. We calculated the market size and revenue share on the basis of revenue generated from major players across the globe. The market forecast is done on the basis of mobile internet penetration and number of apps launched in various areas. Based on indicated disorders, schizophrenia affected population tends to drive the digital pills market and projected to dominate the digital pills market owing to rising schizophrenia cases worldwide. In 2014, 1.1% of the population or approximately 2.6 million adults in the United States aged 18 or older were suffering from this chronic and severe neurological brain disorder and an estimated 40% of individuals with the condition are untreated in any given year. Digital Pills Market Outlook 2016-2024, has been prepared based on an in-depth market analysis from industry experts. The report covers the competitive landscape and current position of major players in the global Digital Pills Market. The report also includes porter’s five force model, SWOT analysis, company profiling, business strategies of market players and their business models. Global Digital Pills Market report also recognizes value chain analysis to understand the cost differentiation to provide competitive advantage to the existing and new entry players. Our global digital pills market report comprises of the following companies as the key players: Proteus Digital Health, Inc., Ostuka Holdings Co., Ltd., 2Morrow Inc., GINGER.IO, PureTech Health, Livongo Health, AliveCor, Inc., WellDoc, Inc., Volutis, Omada Health, Inc., Novartis AG, YUZA, Abbott, MOCACARE, GENTAG, iRhythm Technologies, Leaf Healthcare, Inc., Perficient, Inc. According to the report, major driving factor for digital pills market is that digital pills have the potential to cut out the healthcare costs by substantiating self-medication. In addition, US Food and Drugs Administration (FDA) gave the digital pills approval for medical experts to direct a digital pill that is proficient enough of tracking whether patients have ingested the medicines and allow their caregivers and physician to access the information through a web-based portal. Further, the report states the major challenge related to the privacy and security issues that need to be carefully managed, for instance, it should not be used to track drug ingestion in 'real-time' or during an emergency because detection may be delayed or may not occur. Connected technologies are also vulnerable to cyberattack which in case of digital pills is called as “neurohack” and could potentially be an entry point to infect health care provider networks and expose organizations to a costly data breach. Based on geography, North America is anticipated to dominate the digital pills market owing to the faster recovery times from greater adherence to treatment regimens and cost of healthcare in the US exceeded USD 2.7 trillion in 2010 (almost 18% of GDP), giving huge pressure on providers and administrators to contain costs. Increasing research and drug development, increasing pipeline products under clinical trials and fast and efficient regulatory bodies for the approval make US one of the dominating region in digital pills market. Japan, Germany, UK, Russia, France, Luxemburg, China, Singapore, Indonesia are the opportunistic market for digital pills vendors owing to the presence of conditions like epileptics, bipolar disorders, schizophrenia, pregnancy, those who wearing pacemakers, those who are prone to seizures, etc and efficient healthcare infrastructure. What is the revenue of Digital Pills Market in 2015-16 and what would be the expected demand over the forecast period?